Kasperi Kapanen’s family has deep ties to the game of hockey. His father, Sammi, is a 13 year NHL veteran who is still playing the game in Finland. His uncle, Kimmo, is a former international goalie and his grandfather, Hannu, played out his career in Finland with the club, Jokerit. Kasperi, however, is poised to follow his father’s footsteps to North America as a consensus top pick in the 2014 NHL Draft. 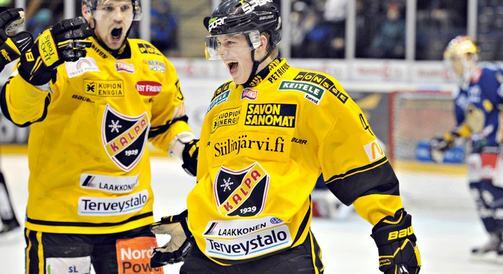 Currently, Kasperi finds himself playing alongside his father with KalPa in the SM-liiga. However, there is some controversy over the younger Kapanen’s standing with the team. His father is a part owner and his uncle is the club’s general manager. That is not to say that Kasperi doesn’t deserve playing time at the top level though. On the contrary, Kapanen is an extremely skilled forward. NHL Director of European Scouting, Goran Stubb highlights Kasperi’s great vision as well as his shooting ability that makes him a real sniper. A good stickhandler, the Finn plays a smart game and makes good decisions with the puck. Also known as a strong skater, Kasperi is a top offensive talent. He is considered to be a long term project though. One of the biggest concerns is his lack of willingness to incorporate a physical aspect in his game. Not necessarily throwing his body around, but rather, paying the price to make a play. If he can get bigger, hopefully some of that tentativeness would dissipate. With that though, he also needs to add a focus on the defensive side of his game in order to increase his value and round out his game. What he does have on his side though, aside from his offensive potential, is his compete level. Karri Kivi, his coach in Finland highlights this as well as his good attitude. Unfortunately though, Kasperi has gotten off to a bit of a slow start this season in KalPa. His consistently strong international performances should prove to outweigh most of those concerns and cement Kapanen as a top pick come June.